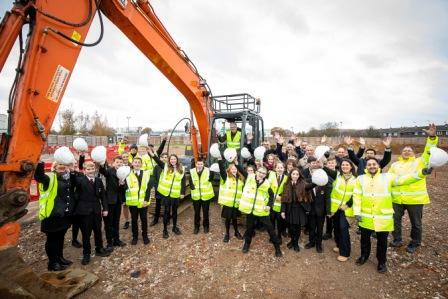 Bulmershe School pupils helped celebrate the official handover of the Bulmershe Leisure Centre site to Wokingham Borough Council’s contractor Pellikaan Construction Ltd, which is building the new £14million sports centre. Pellikaan was chosen following a public tender process which saw five companies submit compliant tenders. The company has designed and built more than 900 sports and leisure centres for local authorities, as well as private clients, in the UK, Netherlands, Germany and Belgium. The tired former leisure centre in Woodlands Avenue in Woodley was demolished during the summer, and planning permission for the new one granted. The new centre is being built on the same spot as the old one. It will include a six-lane 25-metre swimming pool, a teaching pool with a movable floor for larger numbers of groups of ages and abilities to use it, a bigger gym plus a ‘live well’ (long-term condition) gym, a four-court sports hall, and an additional studio and a café. It will benefit the whole community with its up-to-date, accessible and flexible facilities, as well as preventative health services. Bulmershe School pupils were invited to the official handover because their school will be one of the many local and community organisations using the new centre. “This new centre won’t just be a hub for sports – a place to improve or maintain your health. It will be a community focus for people in Woodley of all ages and sporting abilities to enjoy, and socialise, as well as somewhere to go for help to avoid health issues becoming a problem in the first place,” said Cllr Norman Jorgensen, executive member for environment, leisure and libraries. Since its start 70 years ago, Pellikaan has successfully delivered projects including community leisure centres, health clubs, swimming pools and racquet centres, as well as hundreds of schools, hotels, nurseries, offices, apartments, and other industrial buildings. Now Pellikaan is on site, pre-construction groundworks can begin getting ready for construction proper to start next year. The aim is for the new centre to open during summer 2020. It will be run by the borough council’s new partner Places Leisure. While the new centre is being built, former Bulmershe users can use facilities at the St Crispin’s, Loddon Valley and Carnival Pool, Ryeish Green and Arborfield leisure centres.